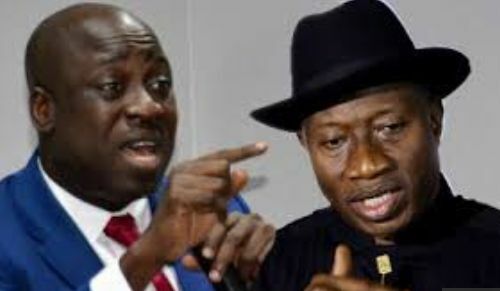 Home / politics / Jonathan Dismisses Saraki's Boy's Book As "Mere Gossip... Full of Lies"
Jonathan Dismisses Saraki's Boy's Book As "Mere Gossip... Full of Lies"
Former President Goodluck Jonathan has dismissed a book written by his former Minister of Youth and Sports Development, Mallam Bolaji Abdullahi, said to be loyalist of SP Bukola Saraki. Jonathan described the controversial book as a mere gossip that is full of lies. The book, titled, “On a Platter of Gold – How Jonathan won and lost Nigeria,” was launched in Abuja on Thursday. At the launch, Borno State Governor, Mr. Kashim Shettima, described the former President as a bad leader who made poor choices while in power. But, Jonathan, in a statement signed by his media aide, Mr. Ikechukwu Eze, in Abuja on Friday, described the governor’s claims as parochial and jaundiced. The former President debunked the allegations of poor governance and highlighted what he described as his key achievements, which he said were yet to be matched by any other leader. Jonathan also accused the governor of frustrating the war against Boko Haram. The statement read in part, “He [Shettima] should be able to tell us if it was Jonathan’s poor choices that led the governor to expose the students of the Government Girls’ Secondary School in Chibok to an avoidable danger, in total disregard of a Federal Government’s directive to the governors in the three states most affected by Boko Haram to relocate their students writing the West African Senior School Certificate Examination to safe zones. The former President said that it was instructive that while other governors in the zone heeded the security advice, Shettima was the only one who “flagrantly” flouted it. "Should we also fail to point out that his decision to reward the principal of Chibok Secondary School, who was uncharacteristically absent on the night the terrorists stormed the school, with the post of a commissioner, did throw up more questions than answers?” he asked. He challenged the governor to explain to the people of Borno State and Nigerians what he did with the over N60bn Local Governments Fund, which he said were left by his predecessor, Senator Ali Modu Sheriff. The former President further described Abdullahi’s book as sour grapes — full of lies and gossip. He said it was unfortunate that Shettima claimed at the presentation of the book that he [Jonathan] wasted the goodwill he commanded because of bad governance and poor choices in office. The statement said, “As a man who had never seen anything good in the administration of Jonathan on account of party and other differences, it has remained our consistent view that in a democracy, Governor Kashim Shettima and others like him are entitled to their opinion, no matter how jaundiced. “However, it is a sad commentary on the character of some of our politicians that they go to any length to make spurious statements in pursuit of the sad narrative to remain politically correct. “We cannot be deceived by his crocodile tears and patronising claim that ‘Jonathan is essentially a decent man,’ which is a ploy he deployed to justify his false allegation of a lost glory. “The man who today speaks of squandered goodwill should be able to tell Nigerians what percentage of the votes Jonathan got in 2011 from Borno State at the height of that his envisaged glory, according to Shettima, and what it became in subsequent elections. The statement further said that the Jonathan government assembled a “yet-to-be-matched crop of dynamic cabinet and economic management team made up of tested technocrats like Dr. Ngozi Okonjo-Iweala (former Minister of Finance), Dr. Shamsuddeen Usman (former Minister of National Planning), Mr. Olusegun Aganga (former Minister of Trade and Investments) and Dr. Akinwumi Adesina (President of the African Development Bank and former Minister of Agriculture)."